Why Are These Wild Dolphins Doing Headstands In The Water? 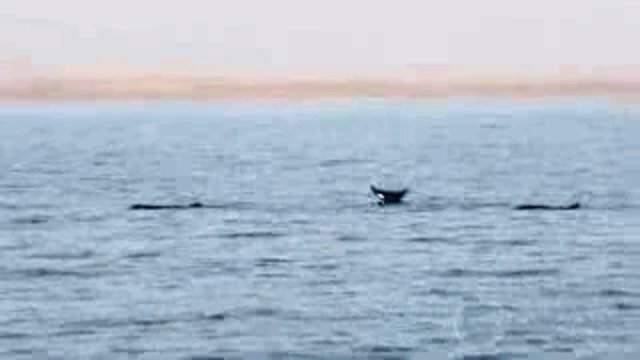 Researchers captured some pretty unusual dolphin behavior on film in the southern Egyptian Red Sea recently -- a small pod of Risso's dolphins with their flukes standing straight up in the air, waving in the breeze. The bizarre behavior, filmed by the Red Sea Dolphin Project is baffling researchers. So what's really going on here? Well, it's hard to say, but The Dodo talked to a few dolphin experts to get their theories. I think they are simply having fun. I have seen this before. They could also be catching the wind with their tail fluke. You might notice that most of the flukes are facing the same direction - the direction of the oncoming wind. "No one knows why they do it but speculation ranges from play (it's fun and feels good) to some sort of thermoregulation," Asmutis-Silvia added. I feel that this video illustrates how little we know about dolphin society, making it nearly impossible for us to adhere meaning to certain movements and gesture. For example, tail slapping in some contexts might be a warning or a threat. In others, it could be a way of getting attention. Also, dolphins have varied and nuanced cultures, just as humans do. In the same ways that a thumbs up in one human culture can be an insult in another, this behaviour could have different meanings between dolphin cultures.